As the last group of fans walked out of Lambeau Field on a Sunday afternoon, the iconic seating bowl looked more like a landfill than the home of the Green Bay Packers. It was quite a collection the 70,000 or more football fans left behind. Paper cups, plastic beer bottles, straws, plastic drink tops, leftover food, some glass, peanuts, wrappers, game programs, pizza boxes, assorted paper, nacho baskets, even cell phones were scattered about on the concrete floor of each row from top to bottom. A few hours after the game, as many as 70 volunteers, wearing latex gloves and carrying plastic bags, worked their way around the seating bowl, picking up and bagging plastic bottles and paper that can be recycled. 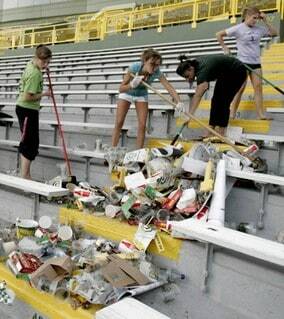 At Lambeau, nearly 6.7 tons of recyclables were collected per game on average in 2007. Last season, that went up to 6.9 tons per game on average. In addition to the volunteers picking up recyclables in the seating bowl, there are containers on the concourses for recycling. While the amount of recyclables has gone up, the amount of solid waste headed to landfills has dropped. Solid waste collected went from 10 tons per game in 2007 to 8.5 tons per game in 2008.